Amir El Saffar is playing with Two Rivers at Symphony Space on September 17. Other dates in the current tour can be found at AmirElSaffar.com. Festival of New Trumpet Music, from September 24 to 29 in New York, can be found at fontmusic.org. All music excerpts are from Amir’s new recording on Pi Recordings, Crisis. New York composer and bassist James Ilgenfritz presents six evenings of music at John Zorn’s venue The Stone, on the corner of Avenue C and East Second Street in the Lower East Side, running from Tuesday October 13th to Sunday the 18th. Anne Rhodes, Megan Schubert, Nick Hallett, James Ilgenfritz (voices) Ty Citerman (guitar) Eyal Maoz (guitar) Denman Maroney (piano) Julianne Carney (violin) Meaghan Burke (cello) Jay Rozen (tuba) Sam Kulik (trombone) Dan Blake (sax) Robbie Lee (woodwinds) John O’Brien, Andrew Drury, Vinnie Sperazza (drums) Nicholas DeMaison (conductor): Composed in 2011 and released on Grant Hart’s Con D’Or records in 2015, “The Ticket That Exploded” is James Ilgenfritz’s William Burroughs-inspired cut-up opera. Mixing text from Burroughs’ 1962 novel and compositional techniques inspired by the Burroughs/Gysin cut-ups, this large ensemble work takes a dystopian look at the impasses of control. Meghan Burke (cello) James Moore (guitar) James Ilgenfritz (bass) Pete Wise (drums): Sloppy avant-grunge math rock from four notable characters in New York’s younger generation of downtown new music performers. The Anagram Ensemble performs works by Jason Cady, Natacha Diels, Anne Guthrie, James Ilgenfritz, Travis Just, Lukas Ligeti, Charlie Looker, Elliott Sharp, Aaron Siegel, JG Thirlwell, and Katie Young, featuring texts taken from William S. Burroughs’ cut-up experiments on the writings of William Shakespeare, Jean Genet, Arthur Rimbaud, F Scott Fitzgerald, JD Salinger, Jack Kerouac, Anthony Burgess, and more. Hypercolor presents music from their self-titled debut on Tzadik Records, as well as new material premiered on their Spring performances in the Southeast, Midwest, and in Italy. Later this month, Dawkins leaves for Europe with the Ethnic Heritage Ensemble, led by drummer Kahil El’Zabar and also featuring Wilkes; in October, New Horizons headlines the Durban Jazz Festival in South Africa. He’s also preparing for this year’s Englewood Jazz Festival, which happens Saturday, September 19, in Hamilton Park; it’s the 16th installment of the annual showcase, which he founded in 2000 and supported in part with his own money for several years in the mid-aughts, after the initial funding stream dried up. Seemingly all-knowing, all-seeing search engines can mislead one to trust that if Google doesn’t turn it up, it don´t exist. Of course we know this to be untrue. 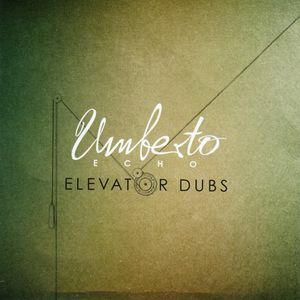 Still, it strikes me as odd that I can only find one, single review of Umberto Echo´s shiny, joyful, early 2013 release Elevator Dubs anywhere online. Of course, there are still other resources out there – perhaps it is all over print media or handmade fanzines or in foreign language press my searches can´t or won´t capture. Either way, this meager presence is hardly commensurate with the album´s stylish, hybrid achievement. Maybe it´s the title. Maybe everyone expected something ambient. Couldn’t be more different – Elevator Dubs grabs your attention from the opening bars and marches the parade along at some pace for its full, fifty-seven minute length. Well, maybe fifty-two and a half (see below, about the closing track). Slick, hard dubbed jazz-reggae, masterminded by German producer Umberto Echo, aka Munich´s Philipp Winter, much admired for production and/or remix work for the likes of Abdullah Ibrahim, Tack Head, Steel Pulse, Josh Roseman, Sly & Robbie, and many, many more, while going public himself with only a few albums and compilation contributions. With such a thick Rolodex, he has had no trouble assembling a massive cast of high-profile, talented (in a few cases downright legendary) singers and players to help him realize this fast-paced, world-travelling project, quick right out of the gate covering Ernest Ranglin‘s “Surfin'”, featuring the mesmerizing intertwining of melodica and muted trumpet, followed immediately by a tongue-twisting Portuguese toast by Brazil’s Bani Silva on “Bonde Di Ihmao”, which elegantly slides into the hopped-up bossa nova of “Travels in Hyperreality” (tip of the hat to the man whose name he dubbed out for show business), led by accordionist Jean Louis Matinier and flautist Bobby Rangel, which Winter redirects through a velvet-rope Mideastern maze into a space age lounge, with Barney McAll at the electric keys. By the title track, the pace has hardly slowed down, but the dub has become more prominent in the mix, keys bubbling, trombones pumping, Matt Darriau of The Klezmatics blowing bagpipes and an end-blown Balkan flute, Aruban percussionist Wally Warning´s vocals dubbed into fractured admonitions. “Obroni Outernational” brings the spirits of Fela Kuti‘s horn section to the forefront, reincarnated as saxophonists Peter Apfelbaum and Ben Abarbanel-Wolff (who wrote the tune). Neatly, the next track is a Fela cover, “Water Get No Enemy”. Singers Earl 16, Luciano, and El Witari pass by. Winter sneaks in his version of German band Senior Allstars “Tomorrow Now” and later, a remix of a tune by The Police’s Stewart Copeland covered by “drummer group” Elbtonal Percussion. Super-relaxed and utterly heavenly, “The Power Dub” even features singing saw. Unexpectedly, the album closes with a ballad a tad too saccharine, sung by Gian Slater, accompanied by a harpist, which just seems to have ended up on the wrong record. A moveable, skankable feast, almost too generous with its portions. A veteran of Junk Genius with Ben Goldberg, T.J. Kirk with Charlie Hunter as well as varied projects with Tom Waits, John Zorn and many others, John Schott is one of the most dynamic guitarists out of the Bay Area. For his third CD on Tzadik he presents an exciting guitar trio with two of his closest musical associates. The third CD from Zorn’s most dangerous new instrumental ensemble is inspired by the work and thought of Swedish playwright, poet, painter, philosopher, novelist, alchemist and occultist August Strindberg, whose dark brooding visions were a precursor to expressionism, surrealism and more. Featuring the long form composition “Inferno,” named after one of Srindberg’s most startling texts, the music touches upon metal, jazz, minimalism, atonality, ambient and more. White hot burning intensity from the mind of downtown NY’s eternally youthful hell-raiser performed by a virtuoso trio forged from the worlds of jazz and metal.